This article is about the philosophical concept. For systems of language obfuscation such as Pig Latin, see Language game. A language-game (German: Sprachspiel) is a philosophical concept developed by Ludwig Wittgenstein and Friedrich Waismann, referring to simple examples of language use and the actions into which the language is woven. In his work, Philosophical Investigations, Ludwig Wittgenstein regularly referred to the concept of language-games. Wittgenstein rejected the idea that language is somehow separate and corresponding to reality, and he argued that concepts do not need to be clearly defined to be meaningful. Wittgenstein used the term "language-game" to designate forms of language simpler than the entirety of a language itself, "consisting of language and the actions into which it is woven" (PI 7) and connected by family resemblance (Familienähnlichkeit). The concept was intended "to bring into prominence the fact that the speaking of language is part of an activity, or a form of life, " (PI 23) which gives language its meaning. Simple uses of language with which children are first taught language (training in language). Specific regions of our language with their own grammars and relations to other language-games. All of a natural language seen as comprising a family of language-games. Later "this" and "there" are added (with functions analogous to the function these words have in natural language), and "a, b, c, d" as numerals. An example of its use: builder A says "d — slab — there" and points, and builder B counts four slabs, "a, b, c, d..." and moves them to the place pointed to by A. The builder's language is an activity into which is woven something we would recognize as language, but in a simpler form. This language-game resembles the simple forms of language taught to children, and Wittgenstein asks that we conceive of it as "a complete primitive language" for a tribe of builders. Jean-François Lyotard explicitly drew upon Wittgenstein's concept of language-games in developing his own notion of metanarratives in The Postmodern Condition. However, Wittgenstein's concept is, from its inception, of a plurality of language games; their plurality is not taken to be a feature solely of contemporary discourse. Lyotard's discussion is primarily applied in the contexts of authority, power and legitimation, where Wittgenstein's is concerned to mark distinctions between a wide range of activities in which language users engage. ↑ Biletzki, Anat (2009) . 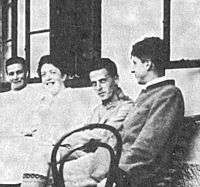 "Ludwig Wittgenstein". Stanford Encyclopedia of Philosophy. Retrieved April 4, 2012. ↑ Michael Foord. "Wittgenstein Philosophical Investigations - Aphorisms 1-10". Voidspace.org.uk. Retrieved 2013-12-12. Jago, Mark (2007). Wittgenstein. Humanities-Ebooks. Wittgenstein, Ludwig (1953). Philosophical Investigations. Blackwell. Wittgenstein, Ludwig (1942). Blue and Brown Books. Harper Perennial. Logico-linguistic modeling. This is an application of the language-game concept in the area of information systems and knowledge-based system design.